This contest is sponsored by Optimist International to give young people room to develop their own views around a central idea. In addition to the opportunity for written expression, participants have the chance to win a college scholarship! Interested students should submit essays on the assigned topic to essays@optimistclubofmilton.org. The essays are judged at the Club level and District level. All entries are due by February 14, 2019! The contest is open to students under the age of 18 as of October 1 2019. Contestants are eligible for only one Club's contest during any given year. No student who has previously won a District Optimist Essay contest scholarship will be eligible to compete at any level fo the competition again. All contestants at each level of the contest must show proof of age before competing. 700-800 words (Title, footnotes and bibliography are not included in the final word count). Hyphenated words count as one (1) word. Words are to be counted manually. There are 2 chances to win this contest. You can win a $500 college scholarship at the local level (Optimist Club of Milton) for first place. Winners at the local level will have the chance to compete at the District Level prize for a plaque and a $2,500 college scholarship for first place winners. Participants must write on the official topic. Each entry must begin with a title page containing: the official topic, numberof words, writer's name, address, phone number, name of school and date of birth. At the top of page 1 should be the official topic and the number of words (penalty of 2 points for lack of topic and 5 points for failure to identify the total number of words correctly). Essays must be typewritten and double-spaced (deduction of 5 points). Each apge of the essay must be numbered starting with page 1 of the essay, not the title page. The numbers must be centered at the bottom of each page. Any quotatios or copyrighted material used must be identified properly. For example, use of a specific writer's format (such as MLA) may be specified by the instructor overseeing the contest. Failure to identify non-original material will result in disqualification. No references can be made in the essay that identifies the student, parents, community, school, sponsoring Optimist Club or District. (Deduction of 5 points or fracftion based on degree of identification). An essay may be writtein in either English, French or Spanish if the language used is an official language of the country in which the sponsoring Club is located. The entry must be stapled together in the upper left-hand corner. Covers of any type are not accepted. 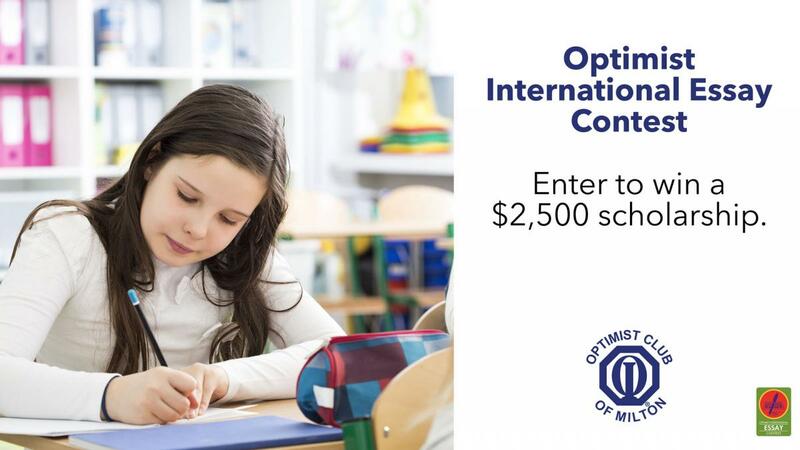 You can enter the contest by submitting your entry, along with a completed registration form (download here) to essay@optimistclubofmilton.org.